Currently, Europe is in transition from a cooler period into a much warmer period as a large trough, which was in effect almost a whole week, is finally decaying. A progressive pattern change in ongoing as a large deep trough is entering western Europe from the Atlantic and should become stationary and will not continue further east. 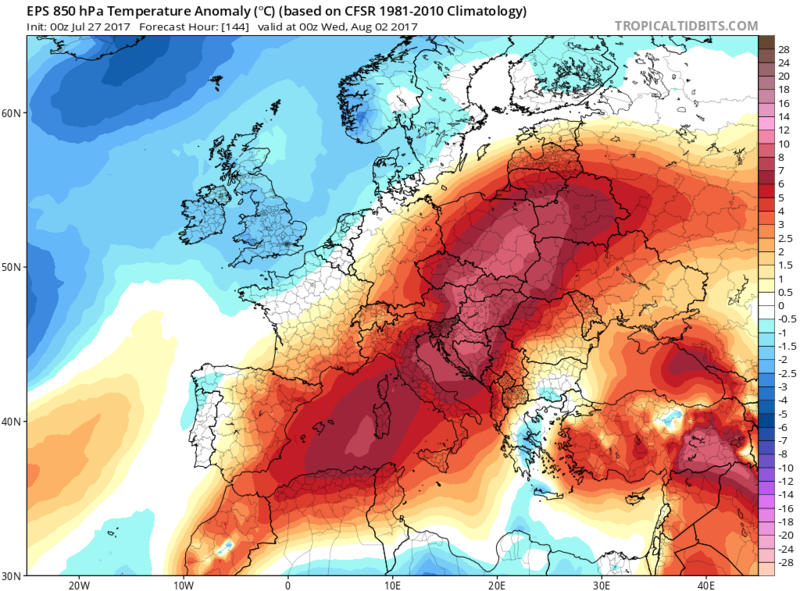 This will establish a significant warming over south-central Europe as an extensive upper ridge develops from SW Europe and Mediterranean into east-central Europe and partly also into southern parts of N Europe. 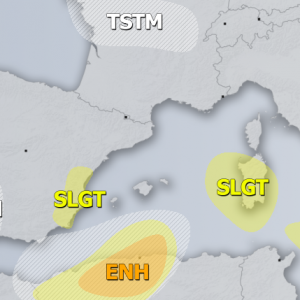 The result will be a powerful heat wave over north-central Mediterranean and the Balkan peninsula, where afternoon temperatures will locally exceed 40 °C. Meanwhile, cooler temps are expected within the trough over W and partly also across SW Europe. Pattern overlook across Europe. Map by Pivotal Weather. A look over the 850 mb temperature map revealing extremely warm temperatures extending from S Europe into N Balkan countries as a strong warm advection taken places under a developing ridge. Heat waves with 850 mb temperature around 25 °C are extreme, and it appears likely that daily averages will be much higher than usual with broad areas experiencing morning temperatures not falling below 20 °C (which is usually confined to coastal areas due to warm seas). 850 mb temperature map. Map by Wetterzentrale. 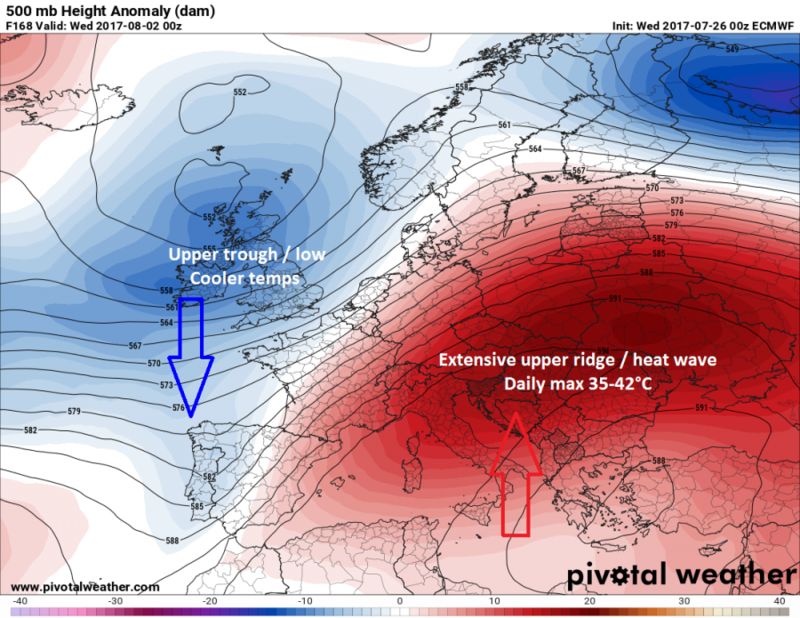 Early to mid next week, the ridge axis extends from the Mediterranean across N Balkan peninsula into NE Europe and starts the significant temperature anomalies. It appears likely that a couple of days could be more than 10°C warmer than usual, which means 850 mb well above 20°C. 850mb temperature anomaly on Tuesday night. 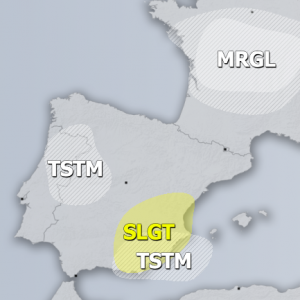 Map by Tropical tidbits. Animation of 850 mb temperature anomaly through the next 10 days – an obvious complete pattern flip from cooler weather into much warmer period! 850mb temperature anomaly animation. 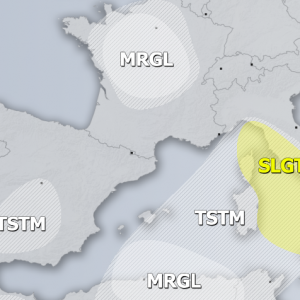 Map by Tropical tidbits. Looking into details of daily maximum temperatures across Italy and Balkan peninsula, some extremely impressive values are seen, peaking up to +43 °C in some areas (large valleys). While it’s still yet to be confirmed in the coming days, there are fair chances some days could have peak values close to all time records locally! It indeed strongly depends on how moist the boundary layer will be in those valleys. Strong overheating and evapotranspiration could maintain high dewpoints but areas where strong drought is present, are prime for extreme heat! 10-day 2 m temperature animation reveals the daily temp variations but the significant heat is pretty obvious starting early next week, expanding from S into CNTRL Europe. 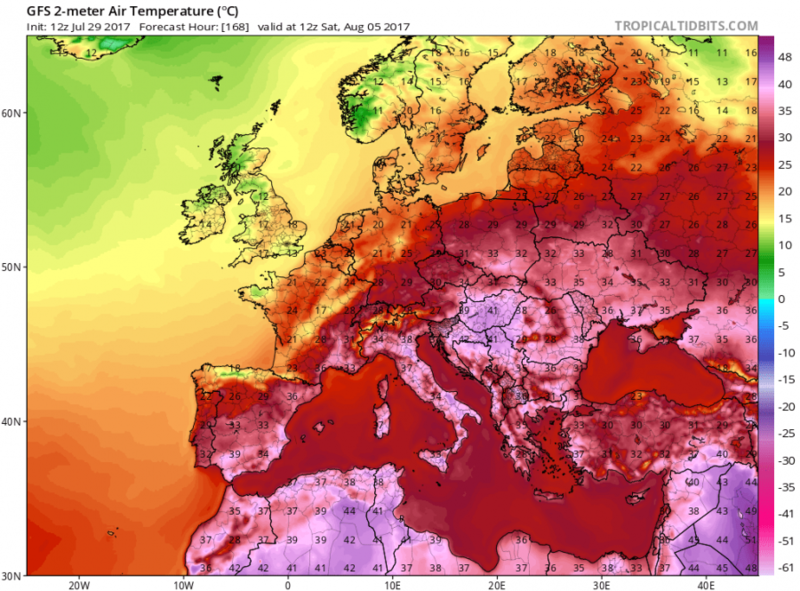 UPDATE – July 29th; Latest model guidance is confirming the extreme heat wave developing from SSW Europe into east-central Europe this weekend, expected to peak by mid-late next week. Some areas will experience max afternoon temps near or even above 40°C locally, which could lead into record breaking values! Especially where intense drought is present which will indeed even worsen in the coming days. Here are expected afternoon temps across Europe tomorrow, Sunday 30th – southern Spain again close to +40°C while some areas in south-central Italy could see 36-40°C as well tomorrow. 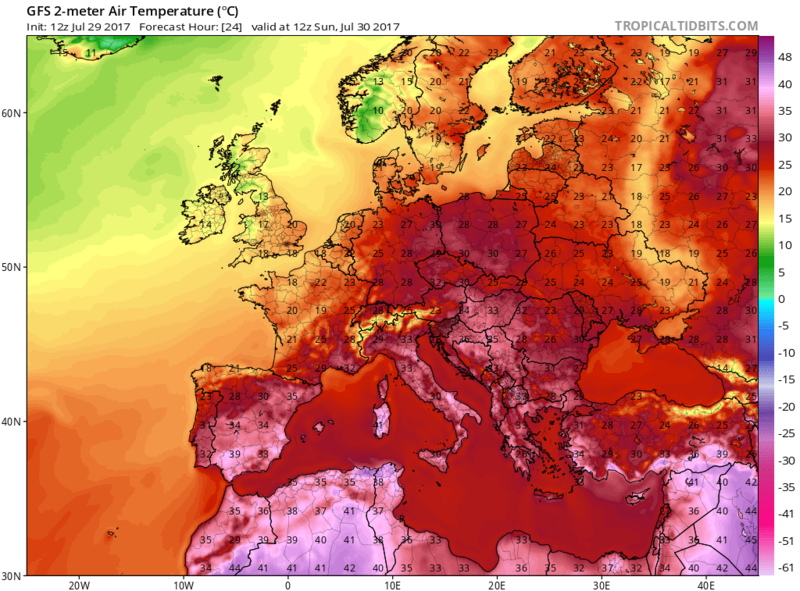 Hot also in central and partly also eastern Europe, from S-E Germany into Poland, Czech Republic, Slovakia into whole Balkan peninsula. This last area could already see max afternoon temps from 34-36°C in some valleys. As mentioned above, the peak of this heat wave is expected during the second half of the coming week when a ridge sits over Italy and Balkan peninsula, there will be lack of winds and drought conditions will worsen and allow lowest levels of atmosphere to significantly warm with temps between 21 and 26°C at 850mb level (approximatelly 1400m above sea level) – this is 6-12°C warmer than average through 5-day period! Given the rather dry environment, the projections for near-surface max afternoon temps hinting there will be a few days of extreme heat with near record values in some places. 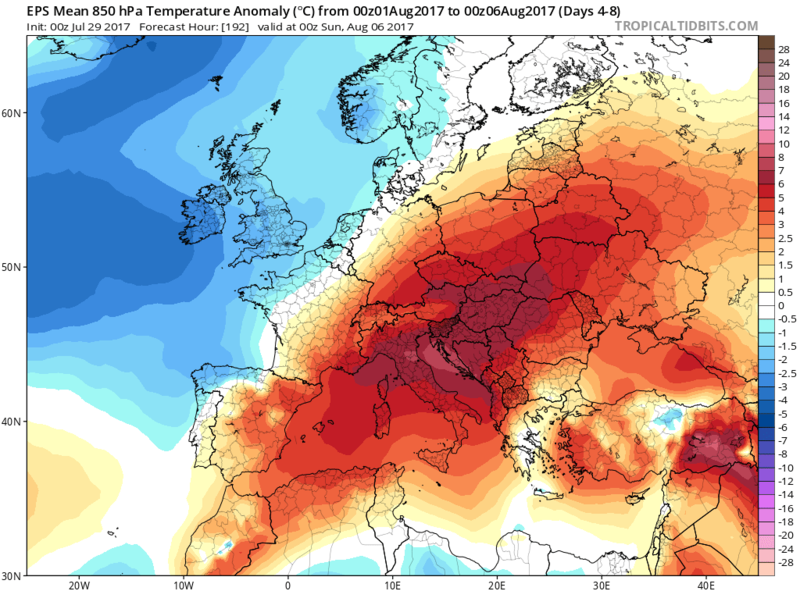 Afternoons could warm above 40°C especially over N Italian plains, Panonian plains and central Balkan region. Stay alert for these dangerous conditions – high wildfire danger and dangerous heat! We will have dail updates on the evolution of this significant heat wave – stay tuned!